Yeoal's Blogzine™| Nigerian Urban, Gossip and Entertainment Site: Picture: Check Out Pres. 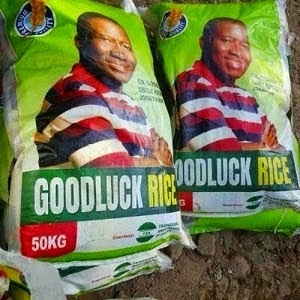 Goodluck Jonathan's "Goodluck Campaign Rice"
Picture: Check Out Pres. Goodluck Jonathan's "Goodluck Campaign Rice"
The president who is running for office again come 2015 is sharing rice to remain in power. If it could work for a certain state governor, why won't it work for our president. But sharing bag of rice though! What happened to trying to woo voters with what you would do for them?